Here is an offering from one for my favorite people. Keith has been a long time friend and was the one that got me started in forging and making damascus steel. 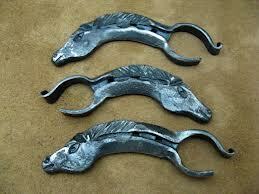 Keith is a farrier by trade and makes these bottle openers from actual horse shoes. They normally vary between 4-5 inches and are most commonly forged with a horse head on one end, although he does do a few other animals when the mood strikes him. I epoxied a magnet on the back of mine and have it right on the refrigerator. These are a handy tool to have in the kitchen, camping or anywhere you might need an opener, as well as these making a very cool conversation piece or gift. These openers are $15.00 each and one or several can fit into a small USPS priority flat rate box $6.00 in the continental USA (please drop me an e-mail for international shipping rates).